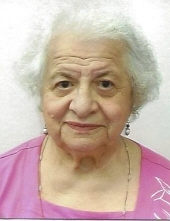 Dolores D'Alessio, 86, of Brockton, passed away suddenly at her residence on Wednesday, January 23, 2019. Born August 27, 1932 in Brockton, MA, she was a daughter of the late Guido and Irena (Tulini) D'Alessio. Raised and educated in Brockton, she was a graduate of Brockton High School Class of 1951. Dolores was a bookeeper for many of the local banks in Brockton. She loved her doll collections and enjoyed traveling and ceramics. She is survived by her brother, Agostino D'Alessio and her nephew Dale D'Alessio both of Brockton. She is also survived by her several other nieces and nephews. She was the sister of the late Guido D'Alessio and Luigi D'Alessio. Calling hours will be held in the Russell & Pica Funeral Home, 165 Belmont St., Brockton on Monday, January 28th from 11:00AM-12:00PM followed by a funeral service at 12:00PM. Interment will take place in the Calvary Cemetery, Brockton at a later date. "Email Address" would like to share the life celebration of Dolores D'Alessio. Click on the "link" to go to share a favorite memory or leave a condolence message for the family.